I'm thinking of doing an overnight stay in one of the lower North island parks and have been wondering about drinking water and how safe it is to drink from the streams, rivers or creeks. I'm not much of a camper so I'm not overly sure about the safety of drinking while out in the middle of nowhere. Are water purification tablets enough? Any recommendations for how to purify greatly appreciated. Live straw is the way to go. Just full bottle and drink from straw. Yeah, I've considered one of those too. Do you get a lot of uses out of each filter? What I used in Asia was two drops of household bleach in each litre of dodgy water. I had two water bottles and drank the older water first because it had a lesser taste of bleach; certainly no worse that Christchurch household water supply. Bivouac in Mercer St used to sell them - two small bottles, about 30 bucks IIRC? Clean water is an investment in your wellbeing, not a cost. Buy once, cry once. Get the right gear that you’re certain of. Thanks all. I went with one if the filter options in the end. The wife found one online. 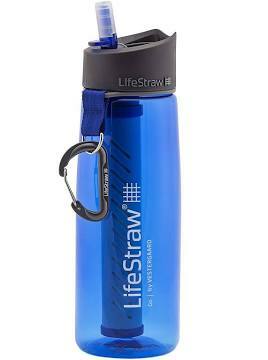 Not the lifestra but a different brand that fits on standard drinking bottles and comes with a collapsing plastic drinking bag too for about the same price as the lifestraw. I have so e purification tablets too. If it's only overnight, just take a couple of litres of tap water with you.